The William Scott Abbott Trust today announced that it has awarded a £1 million contract to Messenger Construction Ltd. 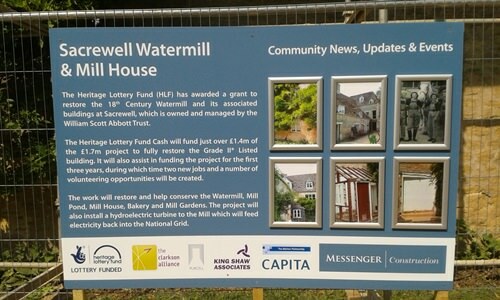 The contract is to restore the Trust’s 18th century Grade II* listed watermill located at Sacrewell, near to Wansford, Cambridgeshire. The 10 month restoration project has just commenced and is using the majority of a £1.4 million grant from the Heritage Lottery Fund (HLF). The whole project is costing £1.7m and is being part funded by the Trust. Messenger Construction is a leading conservation and restoration builder based at Tinwell, near to Stamford, Lincolnshire. It won the William Scott Abbott Trust contract at Sacrewell after a hotly contested tender process against other specialist building firms from all over the UK. Over the next 10 months Messenger will restore and help conserve the watermill, mill pond, mill house, bakery and mill gardens, as well as installing a hydro-electric turbine at the mill. This turbine will feed electricity back into the National Grid. The HLF funds will also assist in funding the project for the first three years, during which time two new jobs and a number of volunteering opportunities will be created. Commenting on the restoration, project officer Jane Harrison of The William Scott Abbott Trust said: “We are delighted to be working with such an experienced and professional local company.